Residents of Hawaii must register their vehicles with their county’s DMV. All vehicles are required to have a registration sticker which must be renewed before expiration. Applications for license plates can be made in person at one of the Hawaiian Department of Motor Vehicles branch offices. Throughout Hawaii, the registration process varies so you’ll have to contact the DMV in your county to obtain the exact documents you need. When you purchase a vehicle at a dealership, the dealer will help you with the registration of your vehicle. They often provide you with temporary plates and submit your registration forms on your behalf. You can drive off the lost and wait for your license plates to arrive. If you’re vehicle is from out-of-state, you’ll have 30 days upon your arrival to Hawaii to register your vehicle. You might be familiar with Hawaii’s plate design which has a rainbow on a white background with black characters. This is the standard license plate issued when you register your vehicle. It is possible to select a customized license plate which represents an organization, occupation, charitable cause, and more. You may also be eligible for disability placards and plates if you have a temporary or permanent disability. There is even the option to personalize the characters on your license plates. These are called vanity plates. You can search for possible plate numbers by performing a free online search. Here’s a list of some of the specialty license plates available in Hawaii. E.g. University Alumni Plates, Humane Society Plates, U.S. Army Support Plates, and many more. E.g. Combat Veterans Plates, WWII Veterans Plates, Persian Gulf Veterans Plates, and many others. Available only for vehicles 35 years or more. There are different plates and decals available in each county throughout Hawaii. Contact your nearest DMV to get an updated list of available specialty license plates. 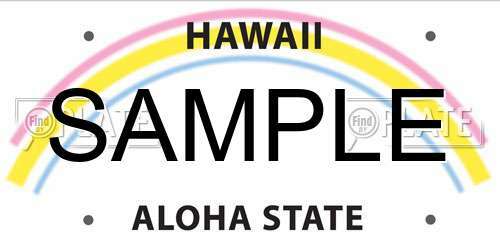 Remember, specialty plates have different fees and renewal rates than the standard Hawaiian license plates. You will likely receive a notification prior to your plates expiring. Expect to wait a week or more for your new decals to arrive in the mail. When you receive them, you can place the new stickers directly over top of the old ones. You will be able to keep your license plates and transfer them to a new vehicle. There are applicable fees for transferring plates to a new vehicle. Please see fees for licenses plates for more information about transfer fees. If you intend to sell, trade, or donate your vehicle and you won’t be purchasing a new vehicle, you are expect to surrender your Hawaiian license plates. Upgrading your license plate (i..e personalizing or getting a specialized style) or moving to a new state are also reasons to surrender your license plate. If you’re unsure whether you should surrender your license plates, contact the DMV and tell them your situation. If you believe your license plates have been stolen, you are obligated to notify the police and create a report. This police report is required for the replacement of your stolen plates. If your plates are damaged, you do not have to report this. Instead, you can bring in your damaged plates, fill out some forms, and get them replaced. Getting your license plates replaced differs significantly within each county throughout the state of Hawaii. You should contact the DMV for up-to-date details. You should contact your DMV to get an accurate quote for your vehicle’s registration. If you want to find out more information about a vehicle, you can look up license plates online. This search tool allows to find detailed information about a vehicle’s history. You can also use it to search for available license plate numbers.